Another recipe from Joyofbaking. This time, I had to get my kitchen top surface all floured up with the rolling pin in my hand to make the tart shells. After cooling the dough in the fridge for more than an hour, it is time to cut the dough. 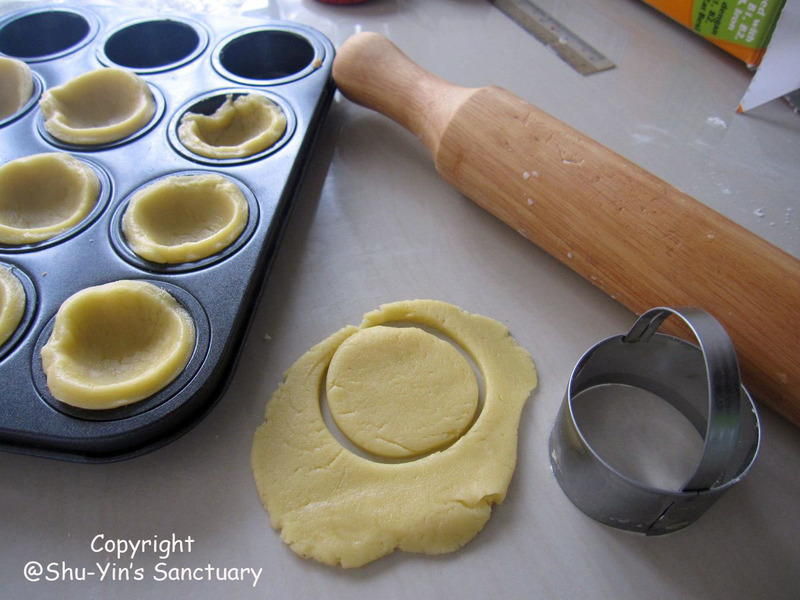 It is easier to use the cookie cutter and cut out rounds of pastry and press it evenly into the mini muffin pan. This pastry has a buttery sweet flavour and shortbread-like texture. I like the last part of this jam tart-making process best of all. I like to scoop small spoonfuls of jam into each mini tart shells before I bake them in the oven. Although recipe says it makes 36 miniature tarts, mine yield only 34 tarts - short of 2 pcs, I ran out of tart dough to make the last 2 pcs. It is delicious. 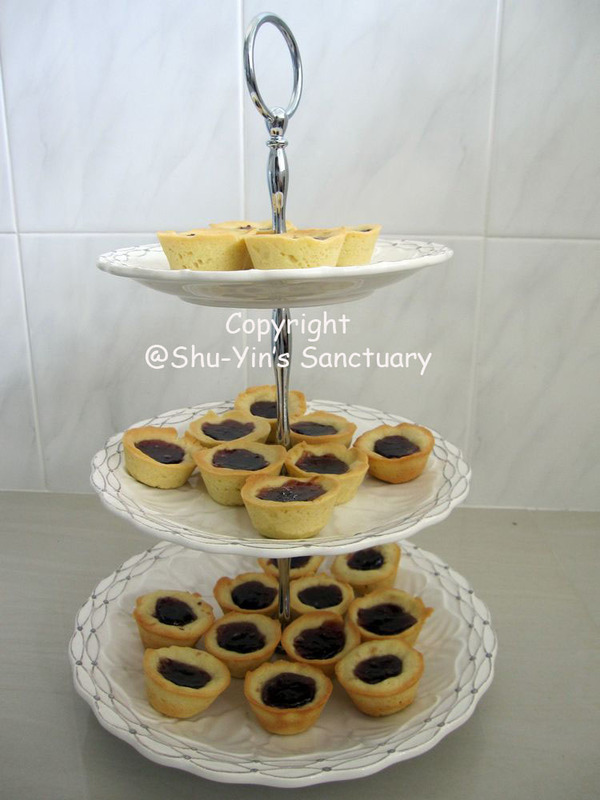 I could taste the warm jam as I bite into my mini jam tarts. 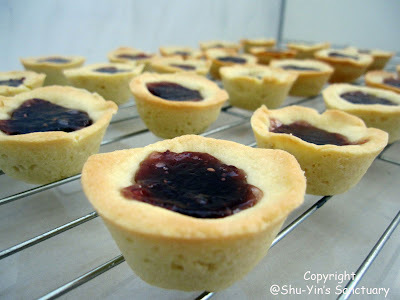 Jam Tarts: In the bowl of your electric mixer (or with a hand mixer), beat butter and sugar until light and fluffy (2-3 minutes). Add the egg and vanilla extract and beat until blended. In a separate bowl, whisk together the flour, baking powder and salt. Add the flour mixture to the butter mixture and beat just until incorporated. Do not over mix the dough. Transfer the dough to a lightly floured work surface, knead the dough a few times to bring it together, and then divide the dough in half. Wrap each half in plastic wrap and refrigerate until firm (at least an hour). 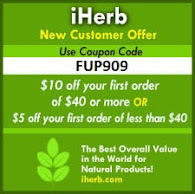 Preheat oven to 400 degrees F (205 degrees C) and place rack in the center of the oven. Have ready 36 miniature muffin tins. Remove one portion of the dough from the refrigerator and place on a lightly floured work surface. Roll out the dough until it is 1/8 inch (.5 cm) thick. Using a lightly floured 2 1/2 inch (6 cm) round cookie cutter, cut out the rounds and gently press them into the muffin tins. 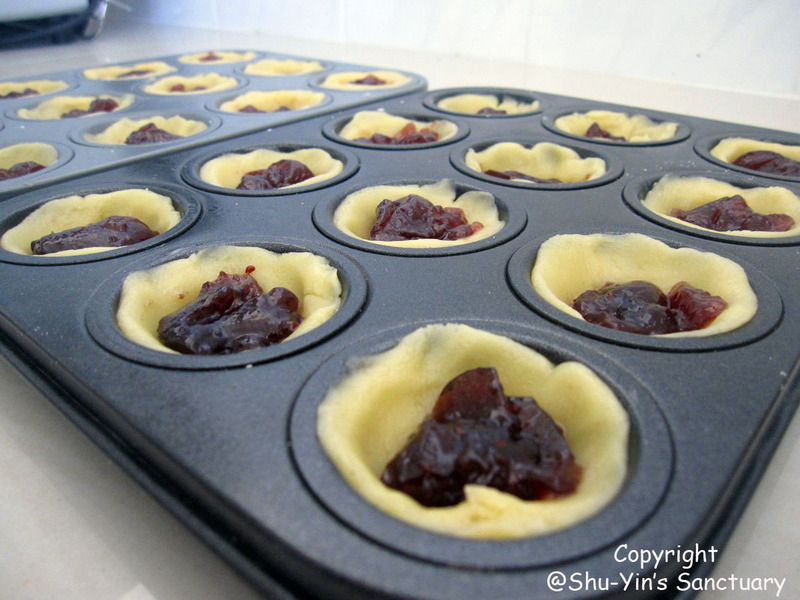 Fill each pastry about two-thirds full with your favorite jam. Bake in the preheated oven for about 10-14 minutes or until golden brown around the edges. Remove from oven and place on a wire rack to cool. Can garnish with a dollop of whipped cream or clotted cream or sprinkle with finely chopped nuts.